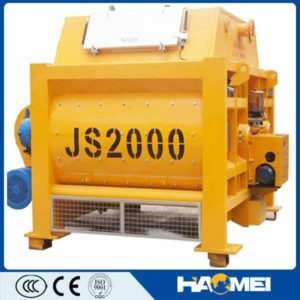 The concrete mixer parts are the composition of the concrete mixer and the twin-shaft forced concrete mixer can be used to mix a variety of powdery materials. The material can be wet fly ash, calcium carbide mud, phosphogypsum, sand, slag, etc. Many large-scale concrete mixing plants now also use it as a host. Double-shaft forced concrete mixer parts is mainly composed of casing, piping, cover plate, stirring device, drive device, screw shaft assembly and other components. JS series and SICOMA concrete mixers are the two typical series in twin shaft concrete mixers. What are the structural features of twin shaft concrete mixers? Let us learn about it in details! (1) The casing is mainly composed of plate and steel and is the support of twin-shaft concrete mixers. The shell is tightly sealed and there will be no fly ash or ash leakage. (2) The screw shaft assembly is mainly composition of left and right screw shafts. (3) Other parts include bearing covers, bearing bushes, bearing seats, blades, gears, sprockets, and oil cups. (4) The structure of the whole concrete mixer parts is reasonable, easy to transport, easy to install and disassemble. (5) The concrete mixers adopt forced twin-shaft forced type, the mixing uniformity is good, the productivity is high, they can achieve good stirring in ideal time for dry hard, semi-rigid, plastic and various proportions of concrete.